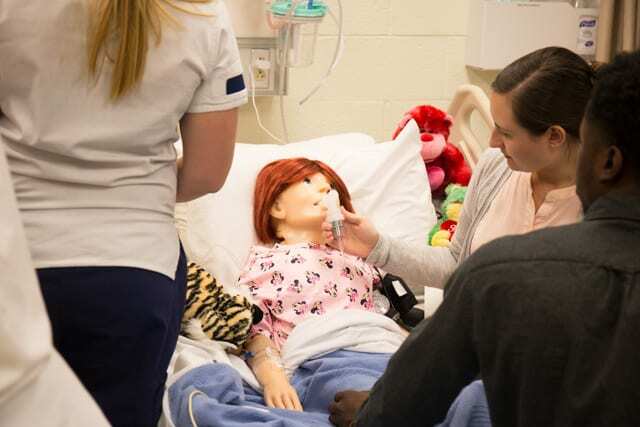 Healthcare Simulation is designed to bridge classroom learning with real-life clinical experience, with the goal of improving patient care and developing quality nursing professionals. Simulation-based experiences are key to learners developing skills, communication, clinical judgement and decision-making. Learning objectives are developed and achieved through real-life patient care scenarios operated in a safe and constructive learning environment. 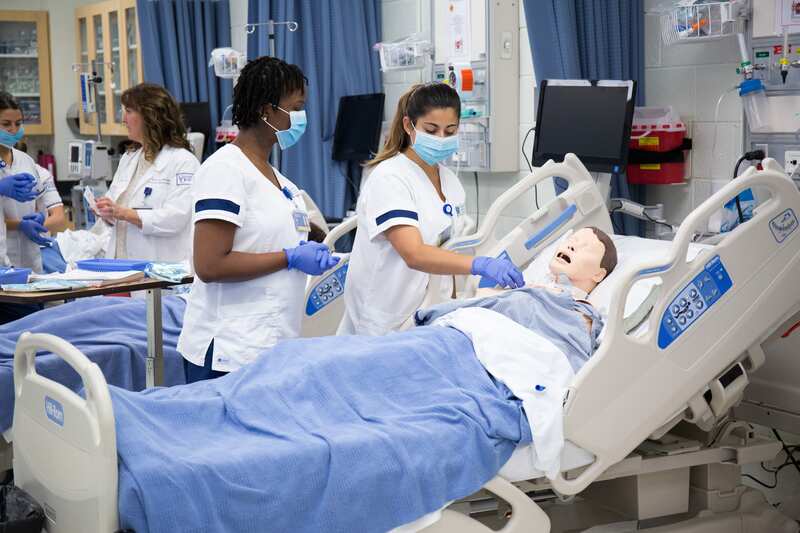 Our state-of-the-art simulation labs resemble current patient care facilities – immersing students in real-life environments. Hospital equipment, audiovisual technology, high-fidelity mannequins, task trainers, and patient actors from our unique Health Care Theatre program, are utilized to enhance realism and provide an effective learning experience. 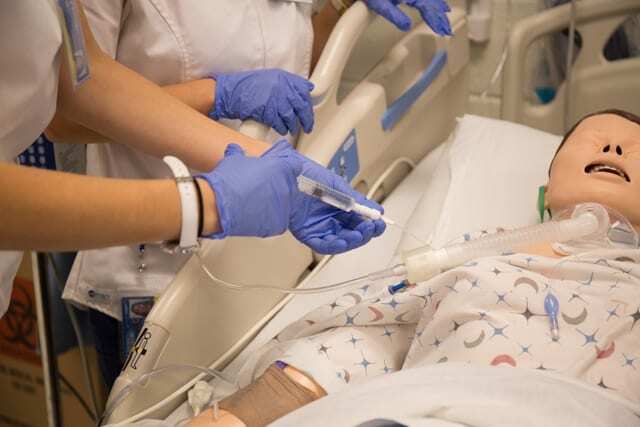 In step with the standards of best practice in simulation, our experienced simulation specialists design/develop simulation experiences with specific learning objectives ranging from basic clinical-care skills to more advanced patient care. On the day of simulation, a pre-briefing is facilitated, giving students necessary information regarding the scenario. Once the simulation is completed, it is followed by an instructor-facilitated debriefing where students reflect and discuss the experience. This piece is crucial to student education, promoting knowledge/skill development while enhancing the student’s self-awareness, self-efficacy, and patient care competencies. Check out our simulation labs or check out our video to learn more! 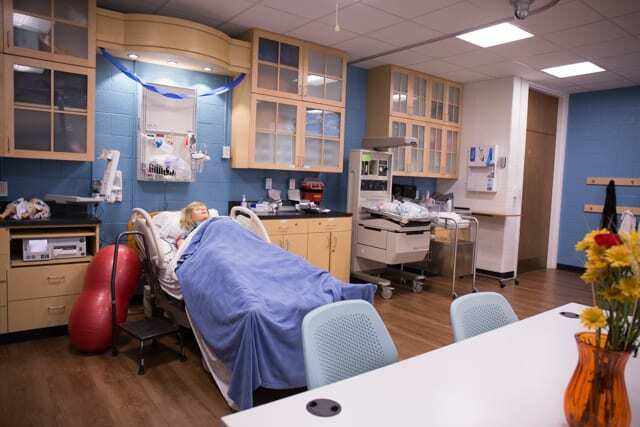 A 2-bed delivery suite designed to reflect a current maternal clinical setting. Further immersion in the experience is provided by the Healthcare Theatre Program which casts the scenarios with birthing mothers, patient family members, and support people. Live patients may even birth a baby themselves using the Laerdal MamaNatalie® Birth Simulator. Technology including audiovisual equipment for recording simulations used in debriefing, as well as computer workstations for online documentation. Bed suites come equipped with Laerdal’s Nursing Anne task trainers, I/V equipment, functional patient headwalls with simulated oxygen/suctioning, and wall mounted computers for online documentation. Advanced Skills include: trach care, suctioning, wound care, and medication administration. Mirrored suites joined together by a central control room with audiovisual technology along with a central briefing/debriefing area. Two Gaumard Adult HAL® patient simulators. Home to some of our IPE simulations where nursing students and physical therapy students collaborate to evaluate patients and provide care. Mirrored suites are joined together by a central control room with audiovisual equipment along with a central briefing/debriefing area. These inter-professional simulated experiences underscore clinical relationships, shared clinical skills, familiarity with other professional roles, and shared mental models to facilitate better patient outcomes.